Seize the day with your own chauffeur and executive black Sedan or SUV taking you from your hotel in San Francisco to Muir Woods, followed by ziplining Canopy Walk Tour in the forest of Sonoma, topped off with a custom wine tour experience of the Russian River wineries in Sonoma county. After 2.5 hours of zip lining, your group is taken to up to a handful of Russian River's greater wineries with great food as well as complimentary (and contingent complimentary) wine tastings. Lastly, your group will be driven back to your hotel/home. The details that concierge will go over with you consist of the following: Pick up time, preferred pick up location (if not your hotel or residence listed), Confirming the pair of local Russian River Sonoma County Wineries we will be visiting after ziplining. Your designated chauffeur will arrive at the time you and your group select upon on booking and contact with Cardinal's concierge service. From your hotel/residence in San Francisco, your driver will whisk you away and up North through Marin County where your group will get to start your day roaming Muir Woods Redwood Park. 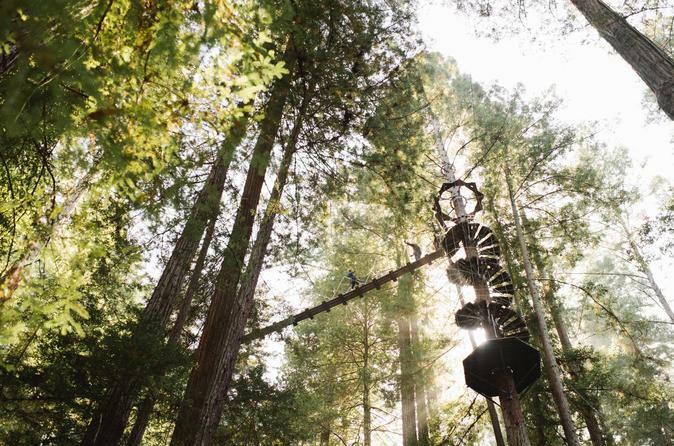 After spending your desired time at Muir Woods Park, your chauffeur will drive you straight to Sonoma County's Guernville forest, where over 2 hours of zip line excitement await. Your driver will be awaiting your return at the end of the ziplining track. Upon text or phone call, your driver will be ready in just moments to great your group and present our company gift bottle of champagne to enjoy in the forest zip line lot before taking off to take your group's first winery stop: Korbel Winery, (where complimentary wine tastings and tours are available. Lunch is also available at Korbel. )Korbel Winery is a gorgeous property deep into the forest of Guernville. You'll certainly notice the crisp air from the tall redwood trees towering around the Winery. Korbel offers tours of their winery on the hour every hour, which allows guest groups to delve into the history of the winery as well as the processes in wine making. After your group's complimentary tasting at Williamson is finished, your driver will take you down to Rodney Strong Winery, known for it's legacy as one of the first 15 wineries established in all of Sonoma.